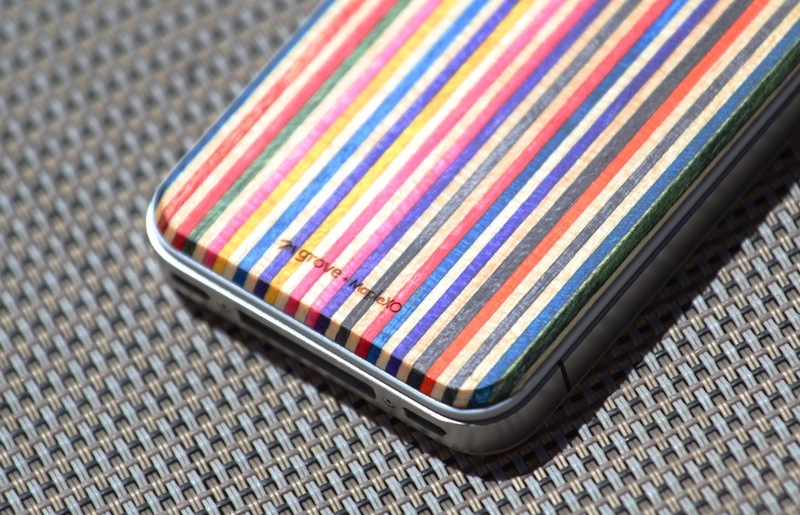 The SkateBack: Sheathing your iPhone in recycled skateboards is cool, but is it practical? As a child of the 80s, I have an intense soft spot for skateboards and skate culture, so an adhesive backing for your iPhone, made out of recycled skateboard material from real factories was something I just had to check out. The SkateBack is a new product of Grove, the purveyors of fine bamboo cases for the iPhone and iPad. The SkateBack is a bit of a departure for the company in that it isn’t using bamboo, instead it’s made of 100% post-industrial skate board material, in partnership with MapleXO, who has been using the same material to make jewelry since 2005. Basically they take the leavings of materials that would normally be discarded from factories making skate boards and turn them into beautiful things, a fantastic idea if ever there was one. The SkateBack comes in three flavors, Calm, Neutral and my favorite, Vibrant. 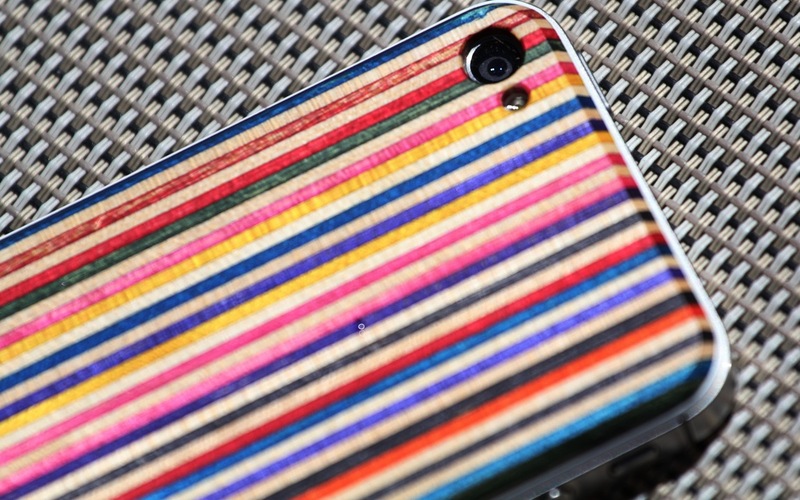 It’s built out of slivers of the material that are glued together to create a uniquely striped pattern. No two SkateBacks are exactly the same. The combination of blonde wood and colored strips on my Vibrant test back is incredibly pleasing and eye catching It elicited many comments from observers over the last week when I took it to Google I/O. Once the SkateBack is assembled, it’s sanded down and a sealant applied, so there is no danger of splintering. The edges are nicely chamfered as well, providing a smooth, handleable finish overall. 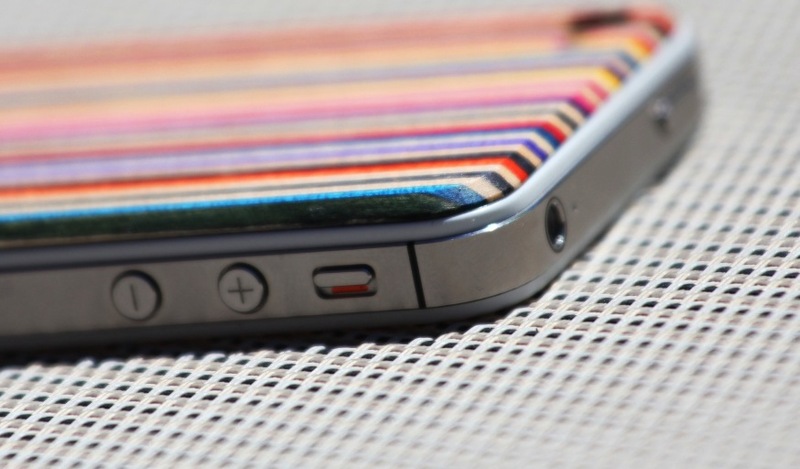 It’s about as thick as the iPhone 4’s glass back, so it will increase the thickness of your iPhone by about 1/4. This isn’t a dealbreaker when hand-holding it, as it really doesn’t add much weight at all, but it does mean that any third-party cases or accessories that depend on the width of your phone being constant are incompatible. That means no Mophie JuicePacks, no Olloclip lens accessory, anything that is dependent on the phone being a set thickness. The ideal audience for the SkateBack is those who normally run their phone ‘naked’ but wouldn’t mind having the back protected when setting it down on less than smooth surfaces. It also offers some general shatter protection for the back glass as it should absorb some nicks and bangs. There’s a lot to love about the SkateBack, the smell of the wood, the feel of it in your hand, the way it gets smoother as it picks up your natural oils. There is, however, one big flaw. The hole provided in the back of the SkateBack for the flash is far too small, causing refraction and destroying any attempts to shoot a picture with it enabled. Without flash, it’s totally fine. With flash, it’s a complete mess. This is just silly for a number of reasons. The thing is, the folks at Grove know better than this. They’ve been making cases for the iPhone since 2009 and their bamboo cases show no signs of this occlusion issue on the iPhone 4 or 4S, I’ve personally seen great shots with those cases on phones with flashes. The iPhone models use a larger oval opening that avoids all of the problems neatly. So why didn’t the SkateBack? Was it a structural issue? A design choice? 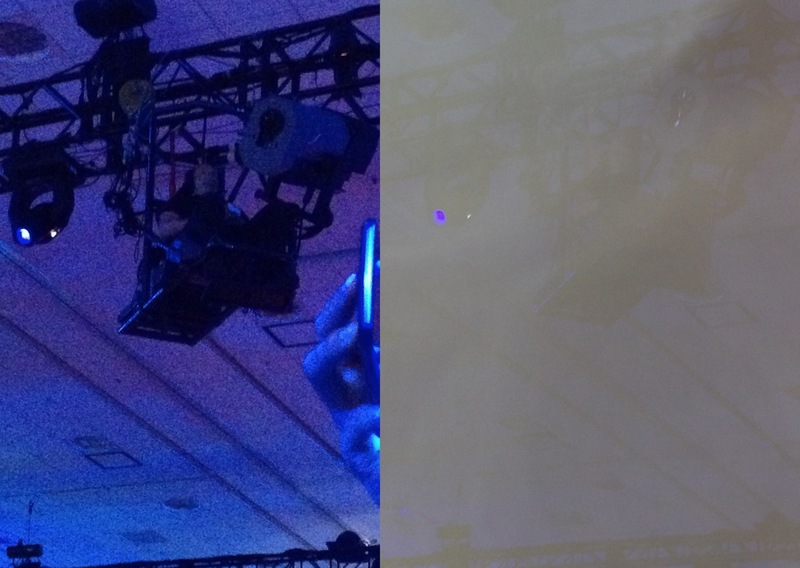 Either way, it’s a big problem for anyone who uses the flash to take pictures. Until the issue is resolved, you’ve definitely got to consider whether you’re willing to give that capability up or not. Ironically, I didn’t notice the problem immediately because I almost never use the flash, preferring to use long shutter apps to gather enough light at night. But, from time to time, it is nice to have the option and the SkateBack requires the use of a supplied plastic blade to remove it, so you can’t just slip it on and off. If that issue gets fixed, I’d have no problem recommending the SkateBack to anyone looking to jazz up the look of their iPhone in an environmentally sound and beautiful way. But, if you use flash photography at all, you’d better hold off for now.